Warning. Spoiler Alert. This is not going to be a fun post to read. Or write for that matter. This is not a fun subject, a joking matter, or something to be taken lightly. Everyone of us has probably, in some way, been touched by suicide. Either we are survivors of it (those left behind) or we know someone who has threatened suicide or someone who died of suicide. As a pastor I would love to say it has never touched a church I have pastored or affected someone in the church. I could give you statistics but that would belabor it. Because I am a pastor, and because I want to reach out to the survivors, I felt a definite need to “read up” on it. 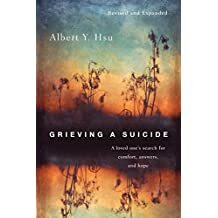 I feel God definitely led me to a book called Grieving a Suicide by Albert Y. Hsu. A few months after his wedding, Dr. Hsu’s father took his life. No doubt depression played a major part in his father’s actions after a major stroke three months earlier. What makes this book so helpful is his personal involvement in it. It is not a clinical “this-is-what-is-wrong-with-people” approach. Nor is it a book which condemns people to hell who take their life (I won’t do that either). What I especially liked about the book is it can be read and understood by the common person. Like me. I have no visions of grandeur about my intelligence. I like things simple. Dr. Hsu does that. He doesn’t back down from the hard questions but neither does he get heavy-handed. The ones who won’t like this book are those looking for proof of condemnation. If you are one of those, go looking at the comics. I prefer not to cross swords or paths with you. Here is one example of down-to-earth teaching: there is some discussion about the use of terms-committed suicide vs completed suicide. I have always use the former but there is someone in the church who uses the latter. His thoughts? Survivor’s react against the former saying it sounds criminal. I’ll grant that now. The latter, he says, “sounds like a laudatory accomplishment…It comes across as somewhat clinical and cold.” (p.169) His suggestion? “My dad died from suicide” or “my dad took his own life.” He also recoils against describing suicide as “successful.” (p.170). I simply cannot recommend this book enough. It is also interspersed with excellent and informative items like “Warning Signs of Suicide”; “Facts About Suicide”; and others. It is helpful if you are a survivor and are looking for help, and it is helpful if you want to help someone. Check out the right sidebar of my blog for more information on the book. Thanks for sharing about this book, Bill. I haven’t heard about it, but I’ll put it on my to-read list. It sounds very important. We all have been touched somewhere along the way by suicide. I am going to suggest this book to my brother who is blind so his wife will have to read it to him, which would be good. Also to the wife of my brother son, who took his life in Oct. 2016. Probably the hardest thing our family has been through. His sweet wife spoke at the funeral and she said this after she talked about some of the good things about Lee. She said, his last act does not define him. Out of her heartbreak she helped many. Thanks Bill suggesting the book. This is a tough subject for sure. I do know some families that lost loved ones to suicide, although its been at least 20 years at this point, they still struggle at times with the subject. I will suggest this book, thank-you for the suggestion. Thank you, Bill, for sharing your thoughts on this book, which covers such a difficult subject in our society. I’ve often wondered how desperate/depressed someone must have to be to take their own life, and it’s worth the time to read and understand more.